Rabbit à la Berlin is the 2010 Academy Award-nominated story of thousands of wild rabbits that lived in the "Death Zone" of the Berlin Wall. This is the first film showing the story of the Wall and the reunification of Germany seen from such an unusual perspective—from the rabbits' point of view. It was as if the green belt between the two walls was designed for those animals. It was full of untouched grass, the predators stayed behind the wall and the guards made sure no one disturbed the rabbits. They had been living there for twenty-eight years, enclosed but safe. With the fall of the Wall in 1989, the rabbits had to look for another place to live. 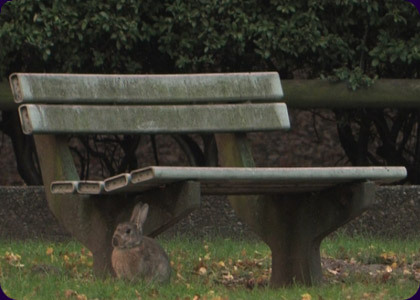 The film is an allegorical, self-described "nature documentary about socialism" which brings together the history of Eastern Europe as seen from the rabbits' unique perspective. Bartek Konopkais a graduate in film studies from the Jagiellonian University, Krakow. He studied journalism and worked as a TV and radio reporter for four years. In 2002 he graduated with a degree in directing from the Kieslowski Film School, Katowice and the Andrzej Wajda Master School of Film Directing, Warsaw. Bartek has directed numerous documentaries for TVP, TVN, MTV, VIVA as well as commercials and videos. He was nominated for the prestigious Polityka Passports Award for the Best Young Talent. He received a Ministry of Culture scholarship for artistic achievements and is an expert for the Polish Film Institute. He is currently shooting his full-length feature debut. Rabbit à la Berlin received an Oscar nomination and his film Fear of Heights received the Hartley-Merrill award for Best Script in 2009. Anna Wydra is a producer and production manager of many, award-winning films, both documentary and fiction. At the Krakow Film Festival 2009 she was awarded a prize for the Best Producer and she also received an Oscar nomination for Rabbit à la Berlin. She runs the production company Otter Films.